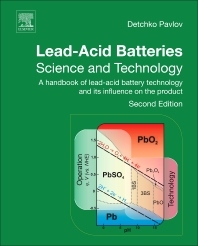 Lead-Acid Batteries: Science and Technology: A Handbook of Lead-Acid Battery Technology and Its Influence on the Product, Second Edition presents a comprehensive overview of the technological processes of lead-acid battery manufacture and their influence on performance parameters. The book summarizes current knowledge on lead-acid battery production, presenting it in the form of an integral theory that is supported by ample illustrative material and experimental data that allows technologists and engineers to control technological processes in battery plants. In addition, the book provides university lecturers with a tool for a clear and in-depth presentation of lead-acid battery production in courses. This updated edition includes new supplementary material (text and illustrations) in chapters 2, 4, 6 and 16, as well as a brand new chapter on the action of carbon as an additive to the negative active material and the utilization of the lead-carbon supercapacitor electrodes. Substantial revisions of other chapters have been made, making the book beneficial for battery researchers, engineers and technologists.